Fabian Vogler (born 1977 in Hamburg, Germany) is a bronze sculptor. He graduated as Magister Artium (Sculpture) at the Academy of Applied Arts in Vienna and obtained his ultimate degree as Master of Fine Art (MFA) at the University of East London. He received several awards for his works, like the Austrian Theodor-Körner-Prize. He was commissioned to create the current Senior Fellow Award of the Academy of Applied Arts, Vienna. 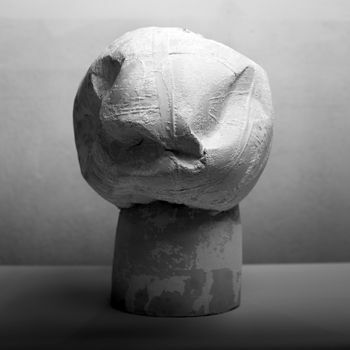 Vogler was course director for sculpture at the International Summer-Academy, Venice. In 2014 he was commissioned to create “Scultura e musica in movimiento” for the Kultur21Festival in Husum in Germany and just this year to design the lifesize bronze of Theodor-Storm’s “Regentrude” for Breklum in Germany. Fabian Vogler is a member of the Federal Association of Fine Artists and regularly takes part in arts symposia around Europe. After a first stay as Artist in Residence at Espronceda in 2013, he is now completing this journey with this years Residence and his show “Liquid Gender”. Fabian Vogler is keenly interested in collaborating with other forms of artistic expression, such as music, soundscape, video, performance and dance. Apart from having created “Scultura e Musica in Movimiento” in Husum he also initiated “Octave Stance” in cooperation with the Trinity College of Music and LABAN in London in 2008. The sound installation “Emotional Decrypter” together with Francesco Giannico for “Liquid Gender” will be another big step into this direction.